Diaper cakes can make a great gift-giving devices for anyone who is going to attend a baby showering event but the process of make them can sometimes be challenging. There is need to understand that this is a cake that is not meant for eating but presenting gifts to the new mom. They are made in such a way that they have a theme that matches the baby shower or any other desired theme. This article will provide you with a step by step process of making a fire truck diaper cake which is firefighter-themed. This can be achieved as we shall see through use of various firefighting elements like reflective ribbons and fire trucks that are included in the diaper cake planning design and design. There are several things you will require in order to jump-start this particular process and they can be obtained in online stores like Amazon. Included here is the link that you can follow in order to get these particular materials (http://www.amazon.com/Firefighter-Diaper-Shower-Truck-Fireman/dp/B0042QU8GE/ref=sr_1_fkmr2_1?ie=UTF8&qid=1388622147&sr=8-1-fkmr2&keywords=Fire+Truck+Diaper+cake+materials ). They include 60 new born diapers, Rubber bands, 8-Ounce baby lotion bottle, Cardboard Cake board, and inch wide ribbons and 4 Ounce baby lotion bottle. Additional items will include a fire fighter truck and toys, Diaper pins, confetti and Stuffed Dalmatian dog. Additional items include silk flowers and ribbons which make the list complete. 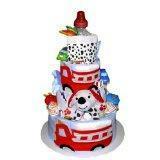 Having all these makes the list complete and you are now ready to make the baby shower cake with a fire fighter theme. 1. The first thing to do will be to unfold a baby diaper and roll it from one to the other and then use a rubber band to keep it folded and in desired position. 2. You will have to repeat the same for five additional diapers and then place the 8-ounce bottle of baby lotion at the center of the Cake Cardboard. Stand the diapers vertically with the bottle to create a ring and thereafter use a rubber band to hold them together. 3. Create the same ring above using 12 rolled diapers and secure it with a rubber band and this makes them 2 rings in total. 4. Using 18 other diapers, form the third ring around the other two you made. Use the inch ribbon with a fire fighter theme to tie around each diaper. Then form two rings of diapers around top of the baby lotion bottle and ensure that they are steady. 5. Items that can be used by the new mom need to be hidden inside this particular diaper cake in these thick layers and then the stuffed Dalmatian dog is placed on top of the fire truck cake. 6. The cake is then decorated with silk flowers and fire truck toys in order to bring out the theme clearly. All all in one guide to making diaper cake and buying diaper cakes online. Perfect for baby showers, gifts, boys, and girls. Videos and instructions to make the perfect cake. Complete guide.